A memorial for aborted children will be built on the site of a now demolished abortion facility in Toledo, Ohio. The Ohio Department of Health ordered the closure of The Center for Choice in 2013 after the facility was found in noncompliance with a Ohio law requiring a transfer agreement with a local hospital. All three Toledo area hospitals refused to sign the transfer agreement. In 2014, the closed abortion facility was put on absolute auction and a group of pro-life leaders from the Diocese of Toledo, the Foundation of Life, the Greater Toledo House of Prayer, and three local pregnancy centers came together to purchase the land. 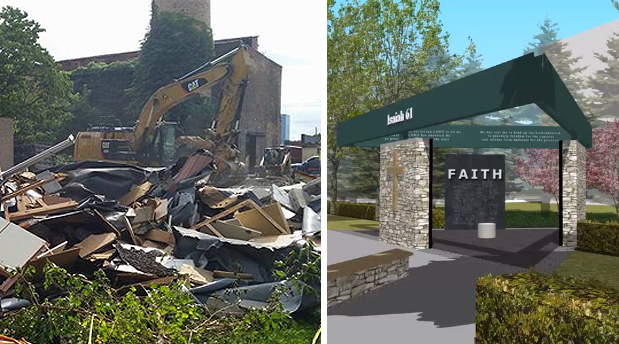 “When praying to keep the center closed, God gave me a vision of a demolished abortion clinic with a memorial park in its place,” Denise Emerine, director of the Greater Toledo House of Prayer said. After purchasing the property, Toledo pro-life leaders began the project, “Isaiah 61,” named after a Bible chapter. The memorial, Hope Park, will be the first memorial park for the unborn in the city. The goal of Hope Park is to offer a space of continued healing for women who have experienced abortion. Hope Park is set to open in October 2017.